For everyone that writes, draws, colours or paints Bruynzeel offers a world of inspiration. Bruynzeel children's pens and pencils are ergonomically designed with small artists in mind; so your young creatives can express their biggest, brightest ideas with ease! As one of the leading manufacturers of children's art materials, Bruynzeel take their responsibilities seriously. Constantly revising their production to consider new possibilities and opportunities in the market, their range is ever expanding to meet growing demands from young artists. Thinking outside the box is second nature to this Dutch company and new options and opportunities are explored as a team to increase the chances of success. They dare to be different and strive to bring new exciting products to the market that will inspire young artists to take their first bold steps into art. Thinking big and acting bigger, Bruynzeel strive to make the most of the opportunities available. New innovations and groundbreaking concepts are always created with the customer in mind, and are specifically tailored to meet the demands of their demographic. Close collaboration with the consumer ensures their success! Exploring opportunities together; daring to be different, thinking big and acting bigger. The design and application of Bruynzeel products are designed to aid your children in every step of the creative process. Drawing stimulates fine motor skills in children and has also been shown to benefit their social-emotional development and creativity. Bruynzeel pens and pencils meet and encoourage this development, but also take into consideration the shifts in demand for children's products. Research has shown that the numbers of hours children spend drawing and colouring has diminished following the emergence of digitalisation. To many parents and scientists this may be an alarming development, but many will realise that the use of a PC or tablet is something most families cannot do without anymore. Bruynzeel have responded excellently to this digitalisation by integrating it into the use of their art materials. Bruynzeel offer children's art supplies in three distinct ranges, that are tailor made to suit their intended demographic. There are materials to suit the youngest artists, a range of essentials that will help them progress their artistic skills and a collection of more advanced pens and pencils that can be used to really break their creative boundaries! All Bruynzeel kids products are compatible with the Bruynzeel 'Colouring the Future' app. Bruynzeel Early Learning offers a full range of colouring products specifially designed for the youngest artists. All products in the Early Learning range are ergonomically designed in order to comfortably fit the smallest hands. They are well designed, safe and above-all fun! 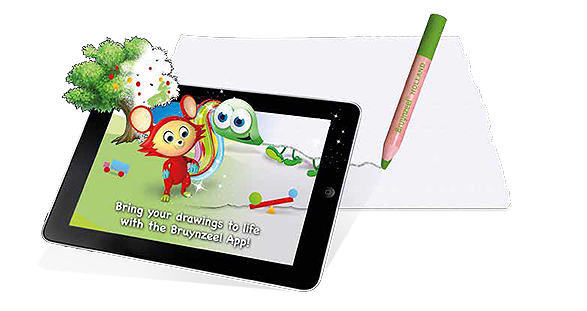 By using the Bruynzeel 'Colouring the Future' app you can bring the Early Learning mascot, Fuzzy, to life and get him to interact with your work. The Bruynzeel Essential Range has everything young creatives will need to further develop their talents! These products are a brilliant source of inspiration and offer all the essentials needed for your children to boost their skills. Whether your child prefers coloured pencils, felt tips or a mixture of the two, they will have everything they need to communicate their big ideas. Use these products with 'Colouring the Future' to bring the mascots Storm and Blossom to life, and feel them inspire you! With the Bruynzeel Creatives range, a whole world of magical products and possibilities open up to help your children take their artwork to the next level! Add a bit of sparkle with Bruynzeel Glitter Pens. Bruynzeel Magic Felt Tips create magical effects and you can watch the colours transform in front of your eyes. There are even Bruynzeel Aquarelle Pencils in the range so your child can take their first steps in watercolour! Use these products with the 'Colouring the Future' App to bring the mascots Chip and Starlight to life and join them on a voyage of exploration! Bruynzeel's 'Colouring the Future' campaign teaches children about the digital world in a fun way while also stimulating fine motor skills and creativity. 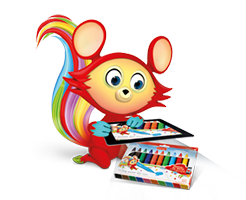 Children can enjoy the fun and benefits of traditional colouring and drawing, and combine this with the use of a tablet. This offers a creative process that is not only fun, but also educational. Data from online resarch shows a massive rise in the amount of time that children are spending in front of a tablet, TV or PC screen. 78% of children aged between 4 and 7 regularly use a tablet if one is available in the house. 54% of children between ages 0 and 4 years regularly use a tablet. 2 Hours - On average watching 2 or more hours of TV a day will result in children falling behind in a social-emotional sphere when compared to children of the same age who watch less TV. This extra time spent watching TV limits time for necessary developmental activities like playing, making music, crafts and drawing. 30 Minutes - Research demonstrates that 30 minutes of screen time a day is the maximum that children aged 6 should be exposed to daily. 10 minutes is the maximum for 3 year olds. 105.7 million tablet users were estimated to be active in Europe in 2016. Ages 0-12 years - This is a crucial part of childhood development both on a social-emotional level as well as when it comes to learning cognitive and motor skills. Drawing is a good way for them to express emotions which they do not yet have the words to convey. It also helps develop motor skills. 30% of a child's day needs to be spent interacting with others. This ensures good social-emotional development. Bruynzeel work with these numbers to ensure that the time children spend immersed in a digital environment is spent creatively and effectively! Bruynzeel offer a complete range of products under their 'Colouring the Future' umbrella, with products suitable fo even the littlest artists up to more experienced young creatives. Bruynzeel are ready to collaborate in your artistic journey to ensure you can create the biggest, boldest artwork! Physiologists, psychologists, teachers and parents are all in agreement that drawing and colouring are highly beneficial to a child's development. Not only is it good for their general wellbeing, it is also a great source of fun. Creating their first artworks is a great way for your child to develop and fine tune their motor skills. Now these skills can be used and devloped in a digital environment with Bruynzeel 'Colouring the Future'. Download the Bruynzeel app from the App Store (Apple) or Google Play Store (Android) and install onto your smartphone or tablet. Open the app and follow the prompt to scan the packaging. Follow the instructions to interact with the characters and download lessons. By scanning the packaging of your favourite Bruynzeel kids products you can bring the characters to life. Your children will be transported into their digital world of fun and creation. Through the app you can download lessons, and the characters will guide your child through drawing tasks and interact with the results. This fantastic interaction between traditional and digital allows your child to draw, colour and play with a tablet all at the same time. The 'Colouring the Future' is available across all of Bruynzeel's 'Inspiring Young' range.